If you have never read a children's book written by Chris Van Dusen, you have missed out on something big. And no, I don't mean King Hugo's humongous head. 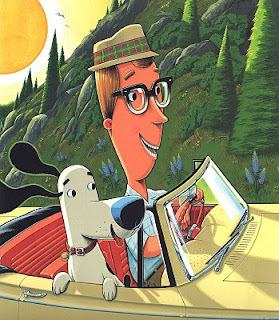 Chris Van Dusen is a fabulous illustrator. His books come straight from the heart, and that is the highest form of praise one can give. His illustrations are magical, exciting, funny and challenging. But, something dramatic happened in the past months and years. Read Aloud Dad is no longer excited about Chris Van Dusen's picture books in the same way. His magical illustrations, they no longer cut it for my kids and me. We found a new source of inspiration in the world of exciting picture books. There is simply a new kid on the block. A certain Mr. Van D.
Wait, I am getting ahead of myself with this story. How did we get to Chris Van Dusen? Who is he anyway? And what are his books doing in our home library? Ah, yes! Blame it on the porcine wonder Mercy Watson. Mercy Watson is a six-book illustrated chapter book series illustrated by Chris Van Dusen and authored by Kate DiCamillo. I remember falling in love with the online previews of the fabulously illustrated, perfectly-sized, hardcover books about a pet pig named Mercy. The 80-page books seemed like true wonders for my twins, so I ordered all six Mercy Watson books a couple of years ago. To be true, despite my initial enthusiasm, nowadays I'm lukewarm about Mercy Watson - mainly because the text by DiCamillo is not strong enough to serve as a credible counterweight to the incredibly rich illustrations by Chris Van Dusen. I learned to live with Mercy, but I set my sights on Chris Van Dusen. Gradually I found out that Chris Van Dusen not only illustrated, but also wrote half a dozen of his own children's books. And what a series of books! One by one, we ordered: Learning to Ski with Mr. Magee , A Camping Spree With Mr. Magee , Down to the Sea with Mr. Magee , If I Built a Car and The Circus Ship. My twins loved them! Every single one of them is a gem. Unmissable books that can be enjoyed by kids of a wide range of ages. My wife and I are almost ashamed how much we enjoy the exciting visuals and roller-coaster stories. The Mr Magee books, two more of which I reviewed (here and here) , are merely ... fabulous! I love the fact that the main character of the books is a typical anti-hero and he has a trusted sidekick - a similarly unremarkable dog. The Circus Ship impressed me as a wonderful extravaganza that you have to see to believe, while If I Built A Car is a book that reveals Van Dusen's full creative genius. Thinking back, I know I was positively surprised by the books when I received them - even though I already knew their illustrations were great. There must have been something more. What was the Wow factor? The quality of print? The size of the pages? The colors? Chris Van Dusen's picturesque words. Yes, I was dealing with something unexpected here. Yes, our love affair with Chris Van Dusen's rhymes grew only stronger and stronger with every new book. No wonder, I was extremely excited to buy his latest 2011 creation - King Hugo`s Huge Ego, a story about "a tiny king with a very large ego". The illustrations are, as always, pure bliss to look at. Yet, for the first time ever, I was seriously concerned that the story would be rejected by my kids. The vocabulary... oh yes, the vocabulary. It was too hard for my four-year olds. The combination of unfamiliar words (thou, thee, congregation, Speech of Adoration, mired, donned, ermine, fringe) and a "historical setting" would prove to be the downfall of Mr. Van D - for the first time ever. 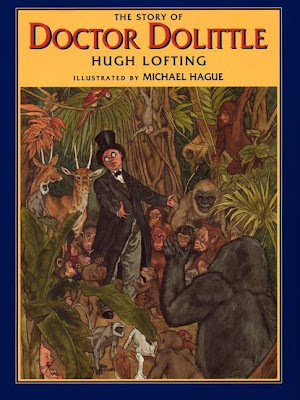 We read it a couple of times, with my kids gushing at the guache illustrations as usual. I thought to myself, OK we can get a strong third reading out of King Hugo when I show them a tiny Mr. Magee hiding on one of the pages and a picture of his little dog Dee on another page. Yep, it did the trick, our third reading was fun as well. But, knowing my little pumpkins, that was it. There was no more room for tricks. They either had to fall in love with the story of the tiny king who let his ego get to his head ... or this book would gather dust on the shelf. Yet, those two little pumpkins just kept asking for more. A fourth reading, a fifth reading - all in one week. Staring at me, from the colorful pages, was the reason. Chris Van Dusen's enormous talent. A talent that merges his fabulous creativity as an illustrator with his respect for children as intellectual beings. Yes, Read Aloud Dad made the mistake of underestimating the book I had in my hands. It is an exciting combination of a fairy tale, outrageous illustrations and rhyming verse that will have you coming back frequently to enjoy this unique combination. The story of a cocky king who one day makes the mistake of pushing into the gutter a young maiden, a sorceress named Tessa. She pays him back by casting a spell that makes his head grow bigger every time he boasts. can fit in your head. King Hugo does not change his ways and his head blows up like an enormous baloon in a matter of days. Yet, a chance encounter between the buffoon king and Tessa makes him realize the errors of his ways. And ... surprise, surprise ... everyone lived happily forever again! Comments like yours make reviewing books worthwhile! Ten kids! Wow! What a proud mom you must be! I am sure that you little ones will adore Van Dusen's books, he is indeed a fabulous illustrator/author. I'm was so happy to read your comment - thanks for taking the time to leave your message. Can you believe I've never read any of his books? ! I have 10 kids and was a 1st grade teacher in public school before homeschooling, but I've never heard of him. I will be checking him out at the library for sure. I still have some little ones that I think will love these - a 3-, 4- and two 7-year-olds. Thanks for telling us about this author/illustrator's talent. So happy you will check them out! Chris Van Dusen's books are among the most treasured possessions in our library. We come back and back and back to them - and they are always as fresh as they were on the first day!